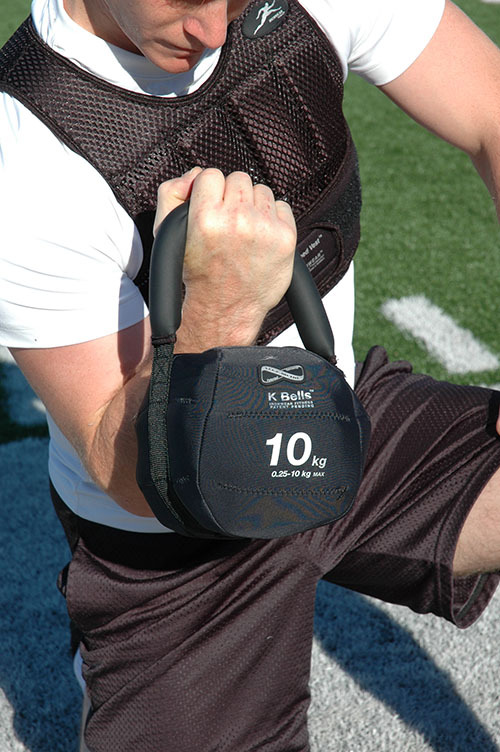 K-Bells™ are the softest and safest Kettle Bells available. K-Bells™ have a unique round diameter foam padded handle designed for comfort and easy gripping. The outer surface is IRONWEAR®'s leather-like padded club fabric which is soft, nonslip, and nonporous for easy cleaning. The inside of the handle has multiple layers for strength and comfort. First is a layer of heavy nylon webbing used for industrial lifting straps and then inside, the webbing is a semi-rigid solid foam handle. K-Bells™ round shell has an oversize overlapping hook and loop opening into which over 40 1/2 pound Flex-metal® weight can be inserted. The closure system holds the weights safely inside without any hardware which might be dangerous if it contacted the skin. K-Bells™ round shell is designed like a balloon or sock to expand and stretch and spread out the load. K-Bells™ round shell has multiple layers of reinforcement. The nylon webbing from the handle wraps around the whole circumference so it can not be pulled off. The K-Bells™ sides are constructed of padded knitted nylon reinforced with heavy elastic and stretch stitching all the way around. K-Bells™ can be easily adjusted from less than one pound to over 20 pounds with the addition or removal of IRONWEAR®'s patented soft Flex-metal® weights. The Flex-metal® weights protect the K-Bells™ shell, you, and everything around you from damage. Upon impact the Flex-metal® weights deform to absorb the force. K-Bells™ are much safer than solid Kettle Bells or Dumbbells where impact is like a sledge hammer on you and everything around you. This allows you to do exercises which would otherwise be dangerous. K-Bells™ are also much safer than weights filled with loose metal shot or sand. Loose weight material puts extra pressure on seams and often leaks out causing a potentially dangerous situation where someone might slip and fall on the metal shot or sand. The combination of the soft K-Bells™ shell and the soft Flex-metal weights makes K-Bells the safest weights for gyms, children, and older adults. K-Bells™ are a great way to use and store your extra Flex-metal weights. 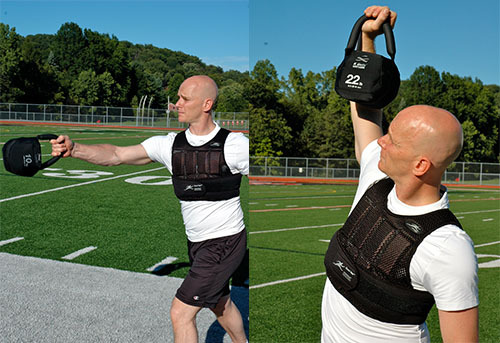 K-Bells™ hold the same 1/2 pound Flex-metal weights that are used in all the IRONWEAR® adjustable weight products including IRONWEAR® vests, pants, ankles, shoes, and headgear. 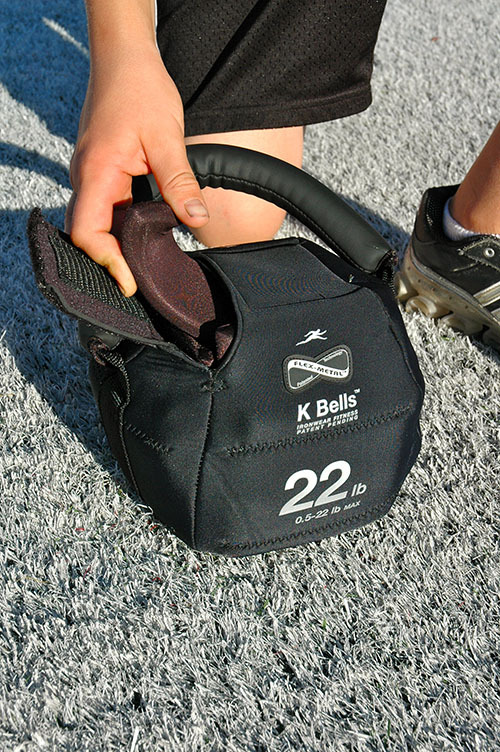 K-Bells™ are the safest and most convenient way to keep your extra Flex-metal® weights from being lost or misplaced. K-Bells™ minimize the amount of storage space required for your extra weights. K-Bells™ are also a great way to transport your extra weights; with a K-Bells™ you always have a place to get extra weights when you want them or store them when you need less weight to work out with. A set of K-Bells™ is also a great way to have the amount of weight you want to use readily available, a pair or more of K-Bells™ lets you move the weights between them. K-Bells™ are available as shells without weights or with 1/2 pound Flex-metal® weights.